You want a product that will last. It should be strong enough to handle both light duty tasks (like when you're mopping up a spill), and heavy duty tasks, like when you're scrubbing the floor of a mall. The aluminium interchange handle can do them all. It's been designed to withstand great forces, including the elbow grease needed when dealing with tough stains, or when you're working a polish into the floor. It's sturdy enough to withstand your kid’s energy, so the little ones can help you out with your chores, without you worrying about the tools getting damaged. The interchange handle can be used in high traffic areas where there is risk of physical abuse, and abrasive cleaning products. It's durability gives it a long lifespan, and this has economic advantages, by lowering maintenance and operation costs, plus it you won't need to keep making replacements. The aluminium interchange handle has been fully anodised. This is the process where a finish coat is integrated with aluminium to give it superior properties. For instance, it makes the handle resistant to ultraviolet rays, and protects it from rust. It also prevents it from chipping, flaking, peeling or blistering. In fact, the anodising coat is actually part of the metal. This coat is chemically stable and doesn't decompose. It's also non-toxic, plus heat-resistant to the melting point of aluminium. The anodising protects the handle from the scars and wear of heavy use. It also makes it easy to clean. In case it gets dirty, you simply have to rinse it with water to restore it original appearance. The anodised aluminium interchange handle has a better sheen and comes with a more professional look. It has numerous applications. The aluminium interchange handle is used on both commercial and residential properties. 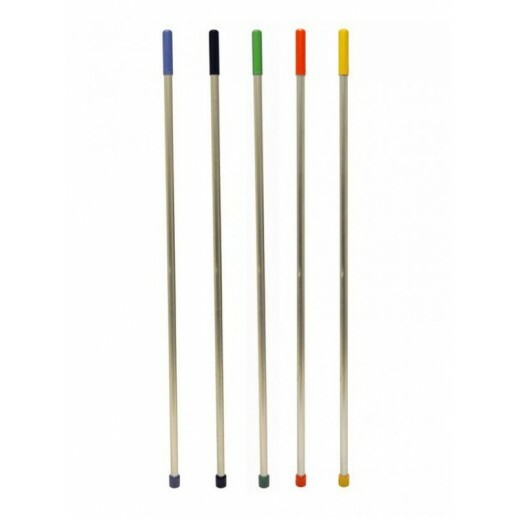 It fits pad applicators, mop heads and even scrubbing brushes. You can use it to work on different kinds of surfaces- from floors and walls to the ceiling of your home or office block. Its length enables you to reach deep into those tough areas like under furniture and far corners. If you're spending your time cleaning, the last thing you want to worry about is your handle absorbing moisture that damages its structure. The aluminium interchange handle is non-porous, so no liquid penetrates it. You won't have to worry about any mould or mildew growth that will weaken the handle. You want a handle that's easy to work with. You should be able to mop floor and wash walls without straining your arms. You also don't want every cleaning task to feel like an exercise regimen. You want a product that your cleaning staff will have an easy time working with. That way they'll get the job done faster, and there won't be any complaints during the regular staff meetings. At home, you don't want to use a handle that breaks your back. The aluminium interchange handle has been designed to be easy to use, and to reduce the effort required when working on surfaces. The handle comes with a good grip, so it won't keep slipping of your hands even under extra force- like when you're scrubbing a stubborn stain on the floor. It reduces wrist movement, transferring all the action from your lower arm, straight to the surface you're working on. This cuts down the risk of injuries such as wrist strains caused by whipping it around. The aluminium handle also comes with a grip at the top of the handle. This serves 2 purposes: it allows you to apply pressure on the surface you're working on; and it can be used to hang it on a wall hook or similar apparatus. Cleaning, polishing and even floor stripping requires the use of attachments such as applicator pads or mop heads. These absorb liquid, which adds onto their weight. When cleaning, the mop also absorbs the dirt from your floor. All this is compounded with the weight of the handle you use, and you may end up baring a huge load. It doesn’t have to be that way. One of the ways you can cut down on the energy you use is by making the cleaning/application tools as light as possible. That's where the design on the aluminium interchange handle comes in. It's smaller in diameter than conventional handles, and is also hollow. That makes it less dense, thus light to carry. This means you won't be hauling around large weights on your arms. By virtue of being an interchange handle, it cuts down on the amount of room you need for storage, since you won't need to buy many handles. One handle can work with plenty of mop heads, squeegees and brushes. The aluminium interchange handle also has a thin diameter, so you won't struggle having to shift around items in order to create storage space in the janitor's closet, or where you store you cleaning supplies. · Always wash it after you’re done. It a simple process of rinsing and letting it dry. You can use a mild detergent, but plain water is usually enough. You can wash it before or after detaching it from the mop head/brush, pad applicator, etc. · Hang it to dry. Use the grip on top of the handle to place it on a hook on the wall. This is beneficial since it allows the attachment (e.g. a wet mop head) to drain easily. · Watch the angle you use to work with the aluminium interchange handle. It's been designed to use the strength of your arms. Angling it out too far makes you rely on your back muscles, which might lead to injuries such as back strains. Interchange Handle - professional results for less!